The Federal Reserve's Factory Production report shows a 0.7% increase for October 2011 Industrial Production, otherwise known as output for factories and mines. September's industrial production was revised down to -0.1% from 0.2%. Here is the Federal Reserve's detailed report. The September 2011 U.S. trade deficit decreased $1.81 billion to $43.11 billion. This is 4.03% drop from last month in the trade deficit. August's trade deficit was revised down from $45.61 billion to $49.92 billion. Exports increased $2.5 billion, or 1.41%, while imports increased $688 million, or 0.31%. 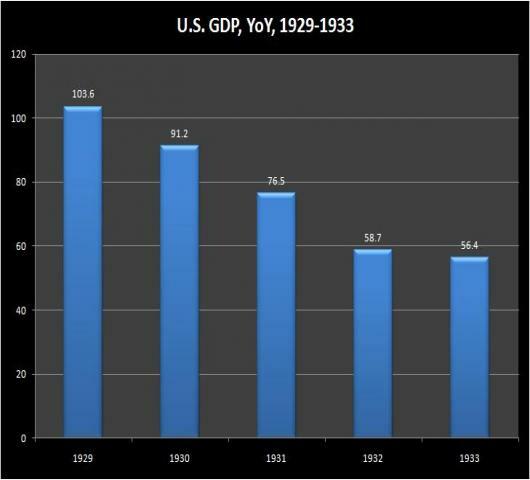 Barry Eichengreen and Kevin H. O’Rourke have been updating us on the progress of this depression by comparing it to the big one, The Great Depression. Their original post, in April 6, 2009, captivated their audience. One thing that struck me was that we might compare the two events to the totally overlooked depression of the 1970s – The Great Stagflation. The reason why this one is missing and, perhaps, lost from official economic history is that it did not look anything like how we expect a depression to look – at least by the accepted, albeit vague, standard of what constitutes a depression. 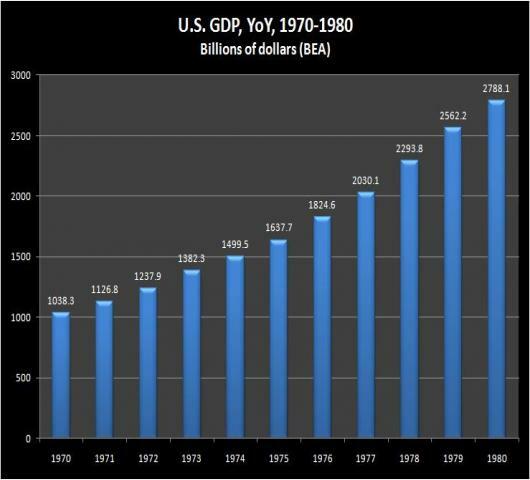 For instance, as shown in the graph below, year over year Gross Domestic Product enjoyed an unbroken expansion during the entire period. The price of gold surpassed its 2009 peak today, hitting an all-time record high of $1,232.50 an ounce. The reason for this is quite simple - Europe is printing nearly $1 Trillion dollar to stem their financial crisis and the markets think all that money will be wasted. This is leading people to blasphemous conclusions. Spot gold XAU= dropped about 1 percent on Thursday after the International Monetary Fund (IMF) said it would sell its remaining gold reserves, but settled in a narrow trading band as the market absorbed the news. Gold was already losing ground early on Thursday and was quoted at $1,114.00 an ounce prior to the IMF statement, which quickly erased a further $8.25 off bullion. "This wasn't totally unexpected given what the IMF has been saying, but it was still enough to give the market a rattle," a gold dealer in Sydney said. Spot gold was quoted at $1,108.10 an ounce at 2219 GMT. The gold price may be correcting, but the physical buying has never been higher. "The United States Mint has depleted its inventory of 2009 American Buffalo One Ounce Gold Bullion Coins. ... No additional inventory will be made available. As additional information becomes available regarding 2010-dated American Buffalo One Once Gold Bullion Coins, you will be notified." So said a memorandum issued Friday to authorized purchasers of U.S. Mint gold coins and reported by Jim Sinclair..
Oh ye Gold bugs, are you gonna love this one. Looks like India is buying the rest of IMF gold, 201.3 tons. India is ‘open to buying’ more gold from the International Monetary Fund, the Financial Chronicle newspaper reported, without saying where it got the information.